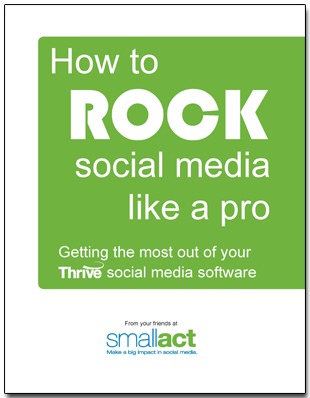 How can Thrive help you ROCK social media? Learn all about it in this guidebook. This guide is not a boring instruction manual or lame FAQ. Rather, this guide is comprised of advice and tips from some of our Thrive power users. Whether you’re brand-new to Thrive or just trying to amp up your social media efforts, your friends at Small Act hope this guide will help you and your nonprofit or association get even better results from your social media efforts. We’ll start our tour with some highlights of the different aspects of Thrive, then wrap up with two daily checklists - one from a large nonprofit with more staff time, and one from a small nonprofit with dramatically less time to devote to it.